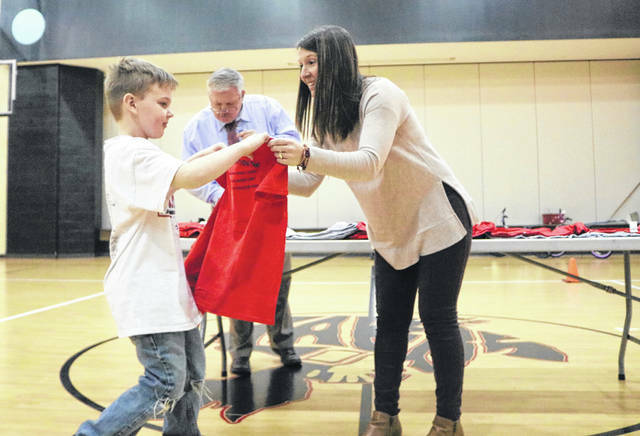 Elementary Principal Molly Hall presents a Laker Zone shirt to first grader Kellen Wester. 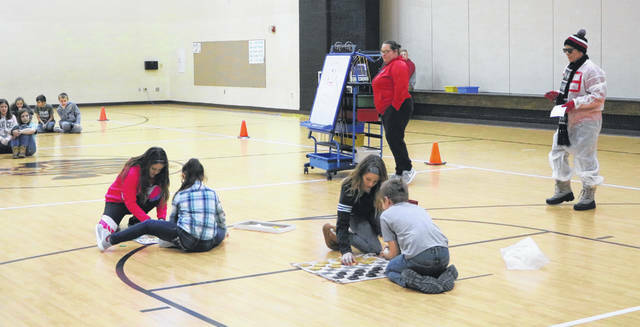 Elementary students demonstrate how to remain in the Laker Zone during inside recess. Do you want to build a Zone Man? Some snazzy snowmen are helping Lakers stay in the Laker Zone during indoor recess this winter. The “Zone Busters” were back during the recent Second Quarter Laker Zone Assembly to demonstrate how to properly play indoors over the next few months when it may be too cold or snowy to hold recess outside. Each day that classes behave properly at indoor recess they can add a feature to their snowman. After 5 days of good behavior they can earn a few minutes of extra recess! In addition, Principals Molly Hall and Jeff Reprogle announced the Second Quarter Laker Zone winners for each class. The Laker Zone is a long-time grant program that encourages students to help others, resist bullying and be hard workers in the classroom. One person per class was awarded a Laker Zone shirt for being “in the zone” for the second 9 weeks. 136 students were also recognized for perfect attendance the second 9 weeks of school. Two lucky students, 1st grader Brier Wilson and 4th grader Kaylyn Crisp, won bicycles.